An injury-hit Milan side battled their way to a 2-0 Victory over Celtic in the opening round of Group H fixtures at the San Siro. 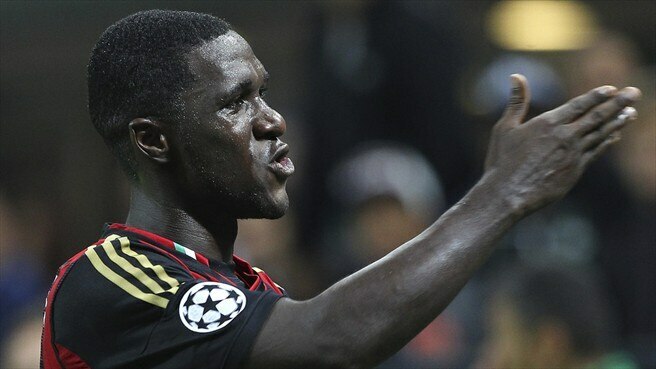 The game was decided by two Milan goals in the last ten minutes of play, Colombian defender Cristian Zapata put the hosts ahead when his shot was deflected past Celtic ‘keeper Forster by Emilio Izaguirre the second was added a few minutes later as Muntari was quickest to react to Forster’s save from Mario Balotelli’s free-kick. Although it was the hosts who started better, they won a free-kick about 25-yards out inside the first minute as Samaras was impeded, Commons however failed to make the most of it as he blazed his effort well over. Milan then began to wake up somewhat after their sluggish opening, they played some nice neat football between Muntari, Nocerino and De Jong, only to waste their chance when Mexes took a pot-shot from 30-yards, Forster stood and watched the wild effort clear his crossbar. Milan continued to look for the opening goal, Ambrose poorly headed a long aimless pass from the Milan defence, and it came out to Balotelli whose volley was beaten away by Forster. Milan’s next opportunity came courtesy of some good build-up play from Alessandro Matri; he held the ball up well, before finding right-back Zaccardo who shot tamely at Forster. It was Walter Birsa’s turn to be left frustrated, Matri put him through on goal and his low shot was well saved by the legs of the Celtic goalkeeper. Milan were in control up to this point without making any guilt-edged chances. Celtic on the other hand were doing a lot of chasing with Anthony Stokes cutting a lone figure up-top. Celtic were given an excellent opportunity as the referee gave them an indirect free-kick, when there seemed to be no offence committed by Milan. Celtic failed to profit from it as Mulgrew’s effort was blocked behind for a corner, which came to nothing. Forster was called into action yet again; he was on hand this time to deny an Alessandro Matri header. After surviving, the few Milan attacks Celtic were keeping possession well and it led to Commons shooting over. Celtic as they grew in confidence got in behind the Rossoneri backline when Izaguirre got to the byline beyond Zaccardo, he put in a decent cross, but there were no takers in yellow, and Milan survived that slight scare. With half an hour gone, Lennon would have had no complaints as his side were matching up to this Milan outfit that looked very poor. Although it was Milan who responded when Mexes found Antonio Nocerino on the edge of the Celtic box in plenty of space, only for the midfielder to narrowly fire over. Celtic continued to have most of the ball, Milan looked happy enough to play on the counter-attack. Six minutes before the break a moment of slackness almost cost Milan – Walter Birsa played a horrible backpass that was gathered by Stokes, he beat Zapata before the recovering Frenchman Mexes deflected his shot wide. The compact nature of Celtic’s defending and the failing of Milan to have any creative spark, meant the crowd began to get impatient. Just before half-time Milan almost took the lead. Balotelli shot deflected off Efe Ambrose, it looked like it was going in only for Forster to get down low and send it behind for a corner, from that corner Muntari’s volley flew over as the half ended all square. Neither side made any changes at the half-way point and again it was the visitors who started better, Commons shot wide from Samaras’ first-time pass. Samaras himself was next to test the Milan defence minutes later he picked the ball up deep, before leaving De Jong and Mexes trailing, his effort though wasn’t good enough to test Abbiati. Milan had another poor start, just like the first period it took them until the 52nd minute to have their first meaningful effort which came courtesy of Balotelli, he scooped his shot over from Nocerino’s floated cross. That started a better period for the home side Balotelli had a further two efforts blocked, then Zapata came close, from Birsa’s corner but Scott Brown did he enough to ensure the Colombian headed wide. With an hour gone, the home side began to grow evermore frustrated at the lack of cutting-edge in the attacking areas. This was after they spurned their best chance of the match Kevin Constant’s cross from the left was met by Muntari, the Ghanaian headed over from close range as it looked like it would be a certain goal. Celtic despite being under pressure threatened themselves, Matthews’ solo run meant he crossed into the box, only for Abbiati to flap at it, the ball fell to Samaras and the Greek’s effort was blocked. Celtic broke away with twenty-five minutes left after Balotelli’s free-kick cannoned off the wall only for Commons to waste the chance after good work from Stokes. With ten minutes left on the clock the game was won due to some misfortune for Stokes, when he saw his free-kick hit the top of Abbiati’s crossbar and some good fortune for Zapata, the Colombian picked the ball up outside the Celtic box after a corner had been cleared, his shot appeared to be going wide, but it deflected beyond Forster as Izaguirre couldn’t get himself out of the way. This gave the home side a one-nil lead. Celtic’s heads went down after that just a few minutes later Milan sealed the victory; Balotelli’s free-kick was well saved by Forster he could get up in time to stop Muntari making in 2-0 to the Rossoneri. Milan will be glad of their win after such a poor performance. Celtic will take heart from the performance, but may have gotten a better result if they would have made more of their many set-pieces, that was the difference on the night, Milan scored twice from theirs.